The Playoff Push Package is back for the 2018-19 season, and this year it’s better than ever! 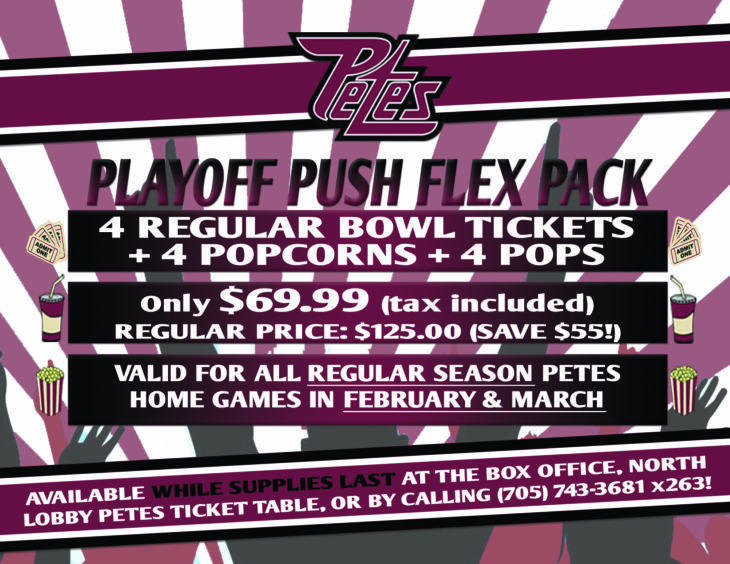 Get four regular bowl ticket vouchers, four popcorns, and four pops to use in any combination to any Petes regular season home game in February or March for just $69.99, tax included (regular price: $125.00). There’s no better way to cheer on the Petes as they make a push to the playoffs. To reserve your package, call Mike at (705) 743-3681 ext. 263, send him an email, or fill out the form below! Interested in Petes tickets? Fill out this form and we'll get in touch with you!